Q: What’s better than a homemade donut? A: One that is purchased at the donut shop. What’s a “fauxnut?” A failure donut. Or a fake donut. Though Stacey sincerely wanted to fry them, the thought of the stench of fried trapped in the house (since it is winter and we’re unable to open windows to air out the kitchen) was not terribly appealing. So she was talked into baking them. She’s pretty sure that the baked donut recipe from the 101 Cookbooks blog was not responsible for her disappointment. 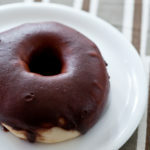 But Alton Brown’s recipe for chocolate donut glaze was a lot runnier than expected. It didn’t stick well to the baked donuts. Oh well. 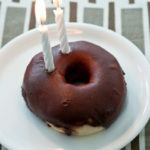 There went our grand plans to impress our readers and celebrate our second blog anniversary with homemade donuts. But we learned a few lessons from our failure. 1) Lower your expectations for success in the kitchen. Especially when first attempting a recipe. Professional chefs perfect their recipes over time with trial, error and lots of tasting along the way. It’s unfair to hold ourselves to extremely high standards, especially when trying something new. 2) A donut is meant to be fried. And/or purchased. Over 10 billion donuts are eaten each year, so clearly Americans like the sweet, fried goodness. 3) Substituting ingredients in cooking is a lot less risky than making substitutions when baking. When cooking, we can add a little more butter here or a dash of salt there to get the flavors just right. In the baked donut recipe, we changed out the butter for shortening. Though shortening can make baked goods fluffier and lighter, the lack of butter likely changed the flavor profile of the donut. 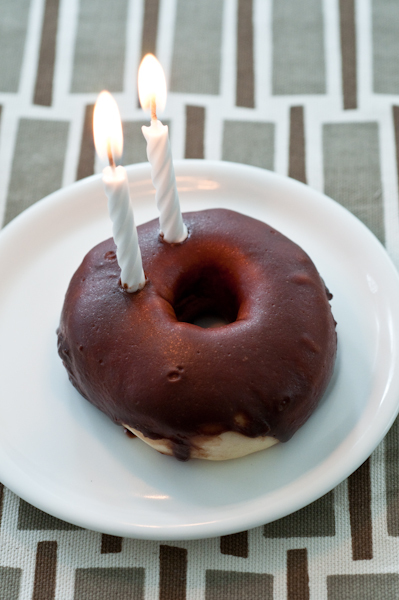 As Every Food Fits enters its third year, we thank you for your readership and participation. Thanks to the many chefs we’ve interviewed – and who have fed us well! – who delight us with dishes from their kitchens and inspire us to be more adventurous when we cook at home. What would you like to see more of on the blog this year? More baked goods? More kitchen failures? More nutrition information? Ha ha, as soon as I saw this post in my Reader, I thought to myself, “I have got to send this travesty to Stacey.” And then I realized you had written it. Happy blogiversary! Yes, more kitchen failures, definitely. Anything to make me feel better about my own fiascoes.